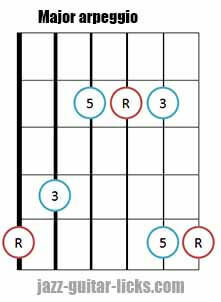 The most basic arpeggio (and chords) forms are called triads. They consist of three notes from a scale: the root note (R), the third note (major or minor), and the fifth (perfect, diminished or augmented). 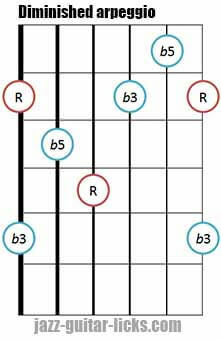 The four main triad arpeggio types are minor (1, b3, 5), major (1, 3, 5), diminished (1, b3, b5) and augmented (1, 3, #5) respectively relevant to minor, major, augmented and diminished chords. 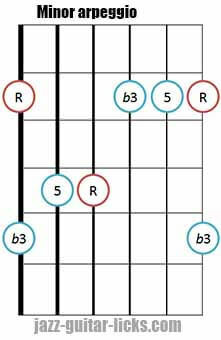 They are three-note chords where the notes are played one by one. 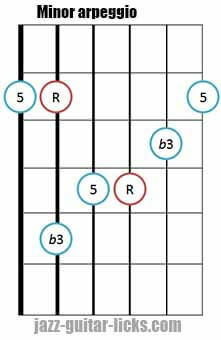 It’s very important to know these basic triads, they are the foundation for all chords. Keep the following in mind. 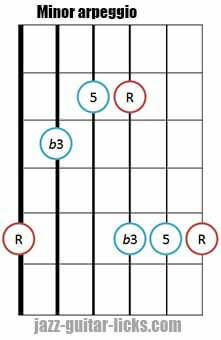 As it is explained in the chart below, a major triad is built with a root, a major third and a perfect fifth. A minor triad is built with a root, a minor third and a perfect fifth. An augmented triad is built with a root, a major third and an augmented fifth. A diminished triad is built with a root, a minor third and a diminished fifth. 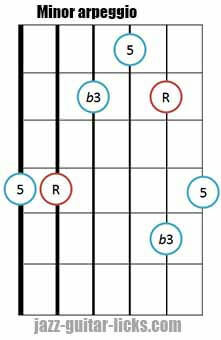 You will find below 20 triad arpeggio shapes divided into four groups : minor, major, diminished and augmented. 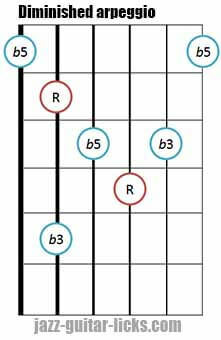 The root note (R) is in red in the diagram. Let's take a look at the harmonized major scale (in the key of C) played in triad arpeggios. 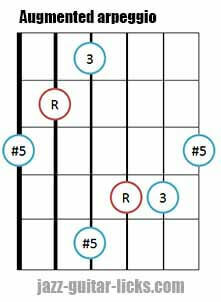 You surely know when harmonizing a major scale in thirds (you can also harmonize a scale in fourths) we obtain seven triad chords grouped into three different types (major, minor and diminished). It is important to memorize the order of the triads : major, minor, minor, major, major, minor and diminished. Please note that there are no augmented arpeggios in the diatonic major scale. You will find them in the melodic minor and harmonic minor scales. 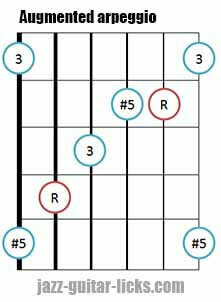 By stacking thirds on each note of the major scale, we obtain seven chords. A third is the second note from the note you are on so for C the third is E, for D it is F, For E it is G. In the key of C we get a C major chord (C,E,G), a D minor chord (D, F, A), Em (E, G, B), F major (F, A, C), G major (G, B, D), A minor ( A, C, E,) and then B diminished (B, D, F). 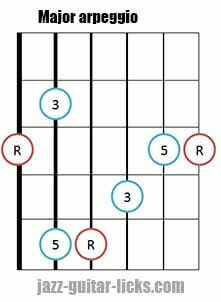 Try to find these seven chords in twelve keys and play them on the guitar. 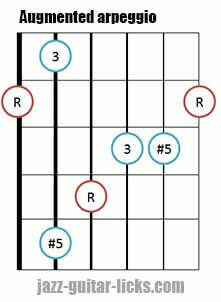 Here is the same C major scale played in triad arpeggio (one octave). 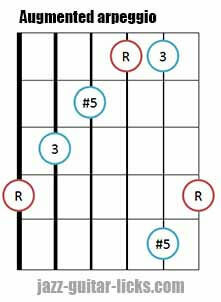 As previously discussed in this lesson, triad arpeggios are made up of the same notes as triad chords. 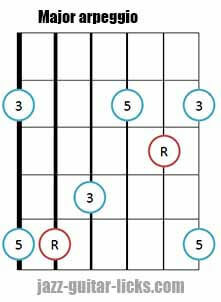 Now try to play triad arpeggios in twelve keys on the guitar. 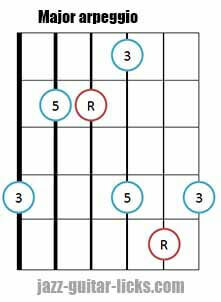 After having identified triad arpeggios on the guitar neck and played them in twelve keys, here are some efficient exercises and ideas to develop them. The "four direction" concept is to play ascending and descending triads and mixing these two directions together. The first direction is to play the triads up & up (ascending movement) . The second direction is to play the triads down and down. The two other directions are a mix of the up & up and down & down movements giving up & down and of course down and up. 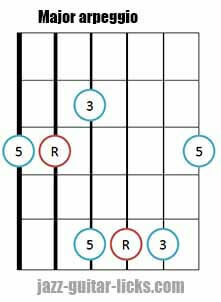 Here is how a 1-5-3 triad arpeggio sequence in C major look like on the guitar. 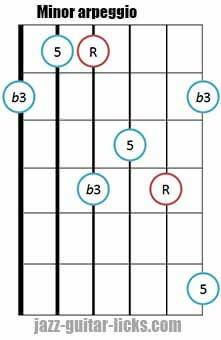 With major chords play the root (1), the fifth (5) then the major third. 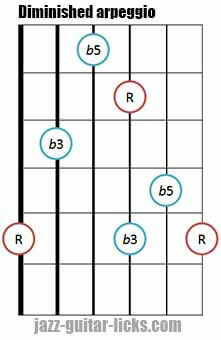 Applying the same sequence to minor chords gives root (1), the fifth (5) and the minor third (b3). 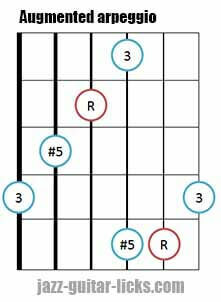 With the diminished chord you have to play the root, the diminished fifth and the minor third. 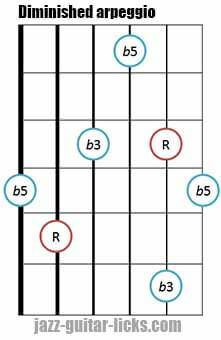 Try to apply the six previous sequences to the four triad arpeggio types (major, minor, diminished and augmented) following the diatonic major scale. 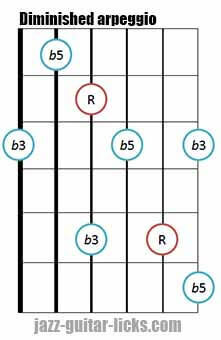 The triads in the harmonic minor scale and the melodic minor scale will discuss later in another topic. Free printable and downloadable guitar cheat sheets with shapes, charts and theory for learning major 7 arpeggios. Ideal for music teachers and guitar students. Hello. At the start of this article there is a mistake probably due to a typo. It is situated in the small portion coloured yellow. this kind of thing can create confusion for them.